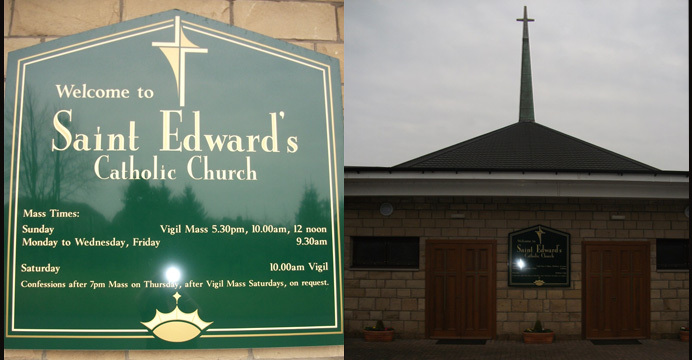 The Parish of St. Edward was established on the 14th of October 1960, originally as an adjunct to the Mother Church of Airdrie, St. Margaret's. 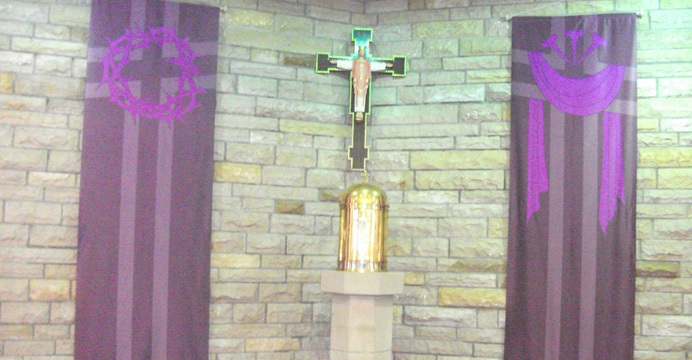 The Catholic population of Airdrie has a long, deep-seated and valued tradition of faith and active practice based in this centre of worship which remains in the present day to be the oldest church in the Diocese of Motherwell. Indeed, the very choice of St. Edward the Confessor as Titular Saint of our parish is due to the close familial and spiritual relationship he enjoyed with St. Margaret of Scotland, such was the influence of the town's Mother church on our early parishioners. However, fuelled by the population growth seen in many West of Scotland towns during the post-war period, demand for places of worship grew in line with the itinerant Catholic population. As such, Holy Mass began to be celebrated in many ad-hoc and makeshift venues throughout the town, in order to facilitate and serve these new communities within their own locales. One such venue was St. Edward's Primary School, which hosted its first celebration of Holy Mass some months prior to the foundation of the parish itself. It was around this main location, and several smaller sites throughout neighbouring areas of the town, that the parish community of St. Edward's began to coalesce and gather. Within a matter of months, it numbered several hundred regular Mass attendees, thanks to the hard work and dedication of its first parish priest, Father Thomas Barry. As an existing Mass-centre with no formal place of worship to call its own, the fledgling parish community of St. Edward's nevertheless enjoyed the full range of celebrations within the confines of the School Hall during this period. 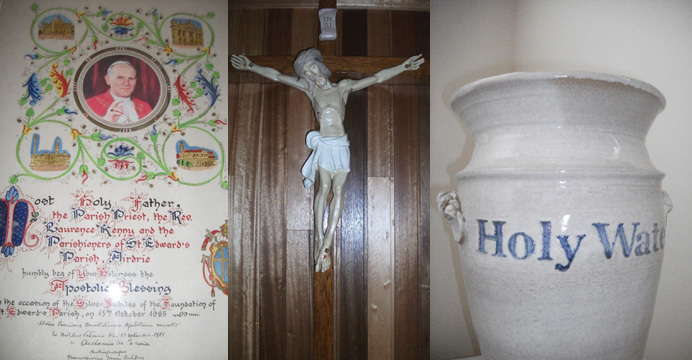 Notable events included Baptisms, First Communions and Confirmations. However, it soon became obvious to the early parishioners that a permanent solution must be found to the ongoing issues of worship and accommodation. In a sense, the success of the hard work in these early years to establish a sustainable parish community was to eventually become a burden in itself; as the numbers of parishioners grew, so too did the inadequacies of the accommodation they were housed in to celebrate Mass. 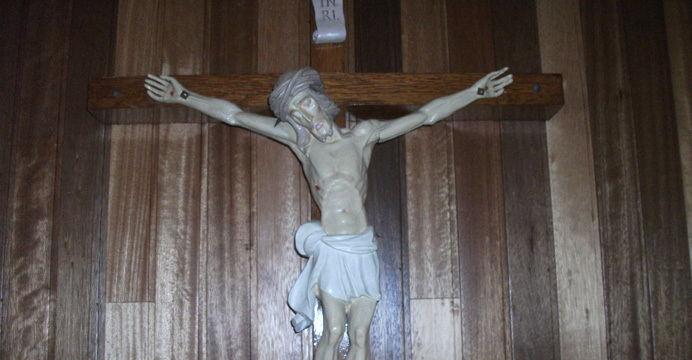 This situation mirrored that of other new parishes springing up in the Airdrie area, with the Catholic community that was to become St. Serf's being of particular relevance in later years to the story of St. Edward's. It was against this backdrop that the search began to source a site upon which a permanent place of worship could be built, which would enable the community to finally have a 'home' and a central point of meeting and celebration. Thanks again to the early progressive vision and spirit of hope displayed by Father Barry and the early parish community, this search was to be a fruitful one and the site upon which the new St. Edward's Parish Church would eventually be built was found in late 1964. Situated approximately half a mile from the existing St. Edward's PrimarySchool, the one acre plot of land at the south end of Carlisle Road was deemd to be the ideal spot, owing to its geographic proximity to the school, transport links and the attendant local communities from which the parish members would come. Indeed, it seemed also that fortune played its part here too, as Father Barry took possession of the site itself on no other day than 13th October 1964 - the Feast of St. Edward. Work began apace to develop and enact plans to construct a modern church suitable to house the ever-growing parish population of St. Edward's. This included a prolonged and hugely successful programme of fundraising, initiated at first by Father Barry but developed and carried out in the main by the parishioners themselves. 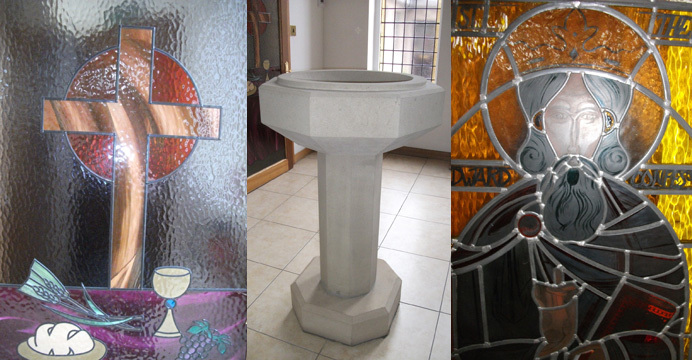 A whole host of fundraising events, including dances, days out, evening socials, garden fêtes and even door-to-door collections were held to establish the funds required to build the parish's future place of worship. This programme of fundraising also played a pivotal social role within the parish community, in that it brought people together under a common goal, and also fostered a strong sense of community amongst the early parishioners and their families. The forward-looking vision of hope, so often a feature of St. Edward's Parish life, was arguably never more in attendance than during this crucial period. 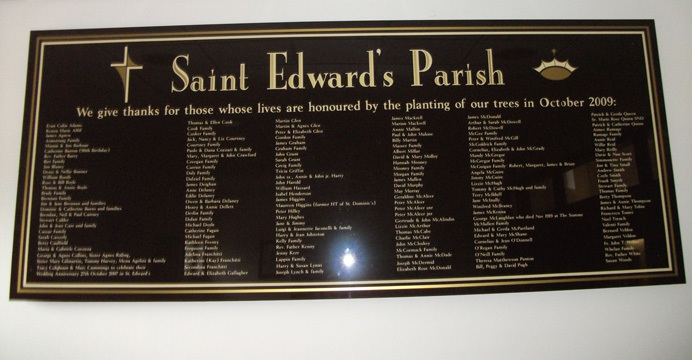 Running parallel to this busy schedule of fundraising in St. Edward's, the community around the likewise-fledgling parish of St. Serf's was also engaged in the development and construction of a new parish church building at this time. With a story almost identical to that of St. Edward's Parish, St. Serf's had similarly sprung up as an adjunct to the Mother Church of Airdrie, St. Margaret's, and had also grown to experience the problems of accommodation brought about by an ever-expanding parish population. Their solution was also to plan and establish a permanent centre of worship, which itself was to be situated in the north of the town. As a result of this parallel development, the expanding parishes and their respective building projects would become entwined as 'daughter' churches of St. Margaret's, and their sense of shared history would deepen as plans for each new church building came into focus in the mid-1960s. Developments in the wider Catholic world also fed into the creation of a permanent home for St. Edward's Parish. The Second Vatican Council, originally convened in 1962, was by this time reaching its final stages and its far-reaching conclusions would come to be embodied in part by the establishment of new parishes and churches throughout the world. St. Edward's was to be no exception, and everything from the community cooperation and involvement, and the clergy / laity fundraising initiatives to the modern design of the building itself would be in accordance with the spirit of renewal and reinvigoration that was sweeping the Catholic world at this time. 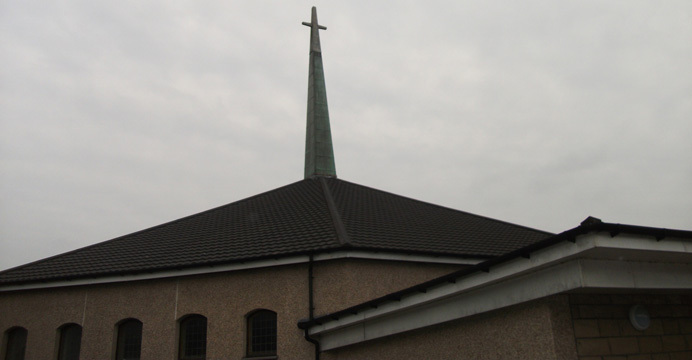 Closer to home, work was continuing apace on the construction of the new church building, and by late 1967 this would eventually be completed and St Edward's parish would finally be able to move into it permanent home. The Solemn Opening of the new Church of St Edward's, Airdrie took place on Sunday 10th December 1967. The inaugural Mass was presided over by The Right Reverend Francis Thompson, Bishop of Motherwell, aided by many members of the clergy including both St Edward's parish priest and curate, Father's Barry and Hayes. The Solemn Opening of our sister Church St Serf's took place a week later on Sunday 17th December 1967. In his homily address to the gathered St Edward's parish community, Bishop Thompson paid tribute to their spirit of hope and tenacity displayed in the preceding years, saying "I am forever grateful for the zeal with which you have founded and built up your new parish for the last seven years". Describing the opening of twin churches as a "rare event indeed", Bishop Thomson expressed his "particular rejoicing that two more congregations have been provided with permanent centres of worship which they have lacked for so many years". He went on to praise " the enthusiastic cooperation I have received from the parishioners of St Edwards....which has made this fine building possible". 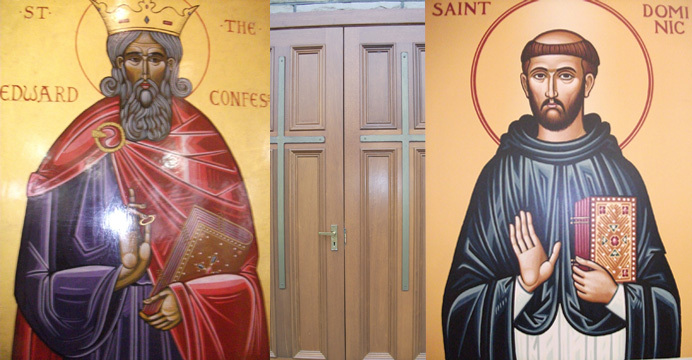 Some nine hundred years after the death of St Edward the Confessor, the new parish in Airdrie named after this beloved King finally had a permanent home to call its own. That this towering feat was achieved by the parish community themselves, through their sustained programme of fundraising and cooperation, was testament to the latent spirit of hope permeating all aspects of parish life at this time. This visionary and fraternal sense of optimism forged through these early years of inception, consolidation and development, would become the bedrock of the parish and its successors in subsequent years. From this initial tumultuous decade of life, St Edward's would expand, develop and mature as a parish over the next few years. A new related Primary School, St. Dominic's, was opened in 1969 to accommodate an expansion in the number of Catholic families within the catchment area. A new parish priest, Father William White, followed too in 1972 and he would go on to firmly established himself in the hearts of parishioners both young and old. The parish's fine tradition of hosting bright and talented assistant priests would be maintained in this period, with Fathers Vivian Hayes, John Cushley and Edward Doherty all serving the people of St Edward's with distinction throughout the 1970s. Important parish lay groups including the Society of Saint Vincent De Paul (one of the original organisations of the parish) and the Union of Catholic Mothers would continue to make a huge difference to the lives of many ordinary parishioners throughout these years. Indeed, in the case of the SSVP, this tradition of service continues to the present day. With the changes heralded by the Second Vatican Council now firmly entrenching themselves in the day-to-day life of the Church worldwide, the parishioners of St. Edward's also heeded this call to become more involved in the rituals and celebrations of the Church. The deeper involvement of the laity in the celebration of Holy Mass in particular, chiefly manifested itself in the number of ordinary parishioners undertaking to become Eucharistic Ministers, Lay Readers and Gift Bearers. In this way, the ordinary community members of St. Edward's embraced the spirit of renewal and change sweeping the wider Catholic world, and once again demonstrated that this spirit was also ever present in the heart of their own community. The 1980s saw the arrival of Father Lawrence Kenny as parish priest, ably assisted by his long term friend Father Denis Garrity. The parish itself went from strength to strength at this time, and celebrated its Silver Jubilee in some style in 1985. Established groups such as the Scouts, Guides and Brownies drew huge numbers of participants from the parish's two schools and beyond, as the church itself became the spiritual hub and community focal point for a whole new generation of parishioners. Tragedy would cut short Father kenny's tenure as parish priest, but his legacy of encouraging community involvement would continue to thrive in the following years as the parish community pulled together to overcome desperation and sadness caused by his untimely passing. The last decade of the twentieth century saw St. Edward's move into its thirtieth year of existence. This milestone was overseen by Father Robert Kane who succeeded Father Kenny as parish priest in 1992. The parish continued to grow and develop during his much loved tenure, and in the early 21st century then saw Father Kenneth Campbell take over as parish priest. By this time the fabric of the 40 year old church building required a substantial amount of refurbishment in order for it to remain suitable and fit for purpose. 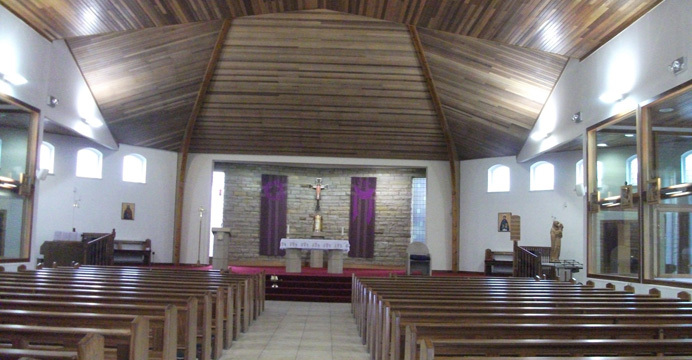 An extensive one year programme of building renewal and modification was undertaken, whereby virtually the entire interior of both the church and the parish house were renovated and refurbished. The parish community, as ever, took this period of disruption in their stride and continued to regularly celebrate Holy Mass in the parish hall, school hall and even on occasion the building site that was the interior of the church at that point. The huge effort and dedication of Father Campbell and the parish community paid off however as, by the time the church was solemnly rededicated on 27th November 2006, it had been transformed into a bright, modern and hugely welcoming building. Arriving in January 2009, Father Gerry McGuinness continued the renovation work focusing on the church grounds, up to date security and the exterior of the church. During his tenure, St. Edward's celebrated its Golden Jubilee on 7th October 2010. Father McGuinness was succeeded as parish priest by Father Stuart Parkes in February 2012, becoming the seventh parish priest in the history of St. Edward's. Father Parkes served the parish for three years, combining his parish duties with being Diocesan Master of Ceremonies and Youth Chaplain. In February 2015, Father Parkes was appointed parish priest of Our Lady of Lourdes in East Kilbride and Father Desmond Keegan moved to the Diocese of Motherwell from the Archdiocese of Edinburgh to assist with the administration of St. Edward's. From this brief history of St. Edward's, Airdrie, it is clear that a sense of change and hope for the future have always been key features of community life within the parish. From the earliest incarnations of the parish celebrating mass in St Edward's School Hall and elsewhere, through the great periods of consolidation and development in the latter decades of the twentieth century, to the modern day refurbishment of our church and its building in this new millennium, it is certain that without the strength afforded by such steadfast convictions, the parish might not have developed into the strong and vibrant spiritual community that it is today.